Angel Heart is the result of superlative filmmaking. 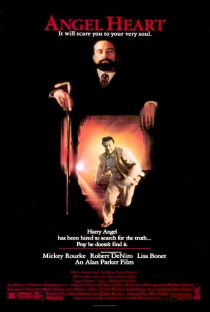 The story of Angel Heart is a powerful psycho-noir thriller. It is a puzzling, disturbing and fascinating ride set in a world few of us have experienced or understand. Eclectic director Alan Parker followed up this excellent piece of screenplay writing and direction with the equally impressive Mississippi Burning (1988). Mickey Rourke stars in his career-best performance. Watching his acting skills in this cult classic, I almost cry at the opportunities Rourke has lost through his reputation as a very difficult actor with whom to work, and his often strange career choices. 1987 saw the release of not only Angel Heart but also another great Rourke feature: Barfly. Robert De Niro also stars in a small but unforgettable role. In my point of view, Angel Heart is one of the best films ever made. Hollywood bad boy Mickey Rourke has lost a lot of important screen time during his career by proving to be a very difficult person with whom to work. Many directors have steered clear of employing him for this reason. Further damage to his acting career was inflicted when, half-way through, Rourke decided to return full-time to the amateur boxing career he had started as a teenager and had to put on hold due to several concussions. Rourke has side-stepped serious roles in many high-profile films in order to concentrate on his amateur boxing career or because he disagreed vehemently with a director’s vision. He turned down roles in Platoon (1986), Rain Man (1988), The Silence of the Lambs (1991), Pulp Fiction (1994) and many more. We can only thank our lucky stars that Rourke returned to serious acting in 2005 and is once again delivering top performances such as the one in The Wrestler (2008). But it is a great shame that his unique and handsome features have been so brutally altered by the poorly-executed facial reconstructive surgery which was required following the appalling disfigurements he endured during his return to boxing. Rourke continues to have corrective surgery to try and recover his original facial features. Rourke continues to make headlines in ways which will only hurt his acting career further. He has expressed his disdain for Iron Man 2 (2010), in which he played a villain. He walked out on Seven Psychopaths (2012) after falling out with director Martin McDonagh. Rourke does not hide his contempt for all things Hollywood and freely admits he is unlikely to ever win an Oscar after his behaviour. Let us keep our fingers crossed that Rourke continues to be offered high quality roles. But it may prove more and more difficult in an environment where risk-hating studios hold the reigns and directors must have their every wish approved by a financially-driven board. It’s great that you’re shining the spotlight on a movie that doesn’t nearly get the attention that it deserves! Oh, dear! The search for Johnny Favorite! That movie gave me the creeps! I still remember Robert De Niro’s long nails while holding an egg in his hands! Impossible to forget! I know that movie by heart! Yikes! If you love the movie, I’d recommend the book behind it: the novel “Falling Angel” by William Hjortsberg. Truly a brilliant book that feels like a homage to Raymond Chandler. Thanks for the post. I also loved this movie when it came out and have been looking for it to come on PPV or On Demand for years. This is the movie that was partially responsible for getting Lisa Bonet fired from the Cosby Show. It was indeed disturbing but still a fine, unusual and original film. Thanks for posting about it! Thanks for the countless posts on such great movies ! I haven’t seen or heard about this one yet. The movie seems very promising, I’ll try to view it some time soon. Great movie. Robert DeNiro did an excellent job. Robert De Niro was so hot in this movie…….he’s a good little devil! One of my all time favorites, I have watched it repeatedly and also love Barfly. Mickey Rourke seems like such a reluctant but truly remarkable actor. A good mystery movie. Mickey Rourke’s best screen performance.